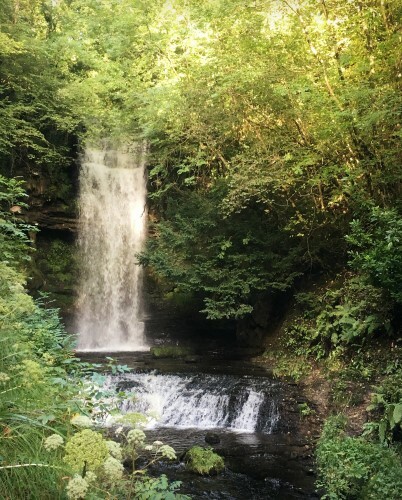 Glencar Waterfall is a special feature of the Leitrim landscape. At only 50 ft high, what it lacks in size, it certainly makes up for in atmosphere and energy. This surely is a place where fairies live! And after all, there’s nothing quite like casually walking around, mingling with the day trippers, a cottage under one arm and a camera in the other. 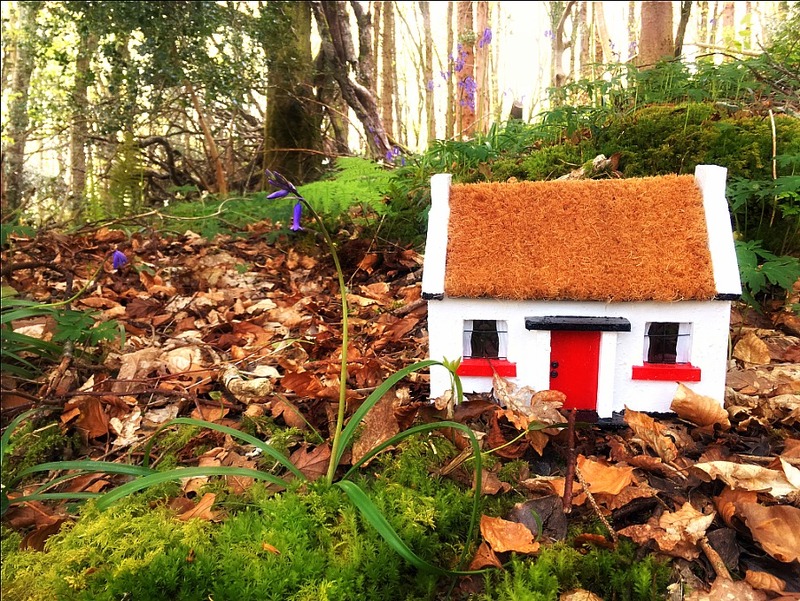 I think the result was worth it though, since the cottages tend to suit quirky environments. 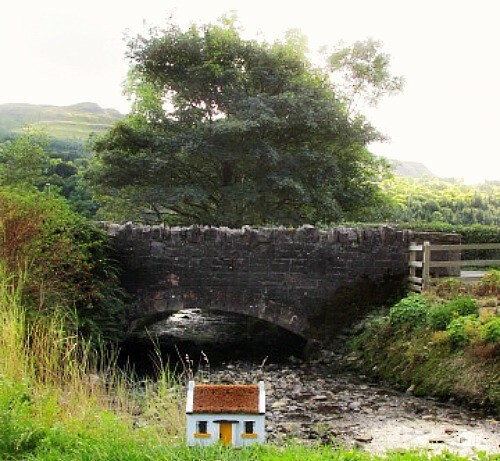 The little yellow cottage looks so right at this bridge and babbling brook, which is just at the entrance to the waterfall. Incidentally, we tried this before over Bealtaine Weekend on 1st May. 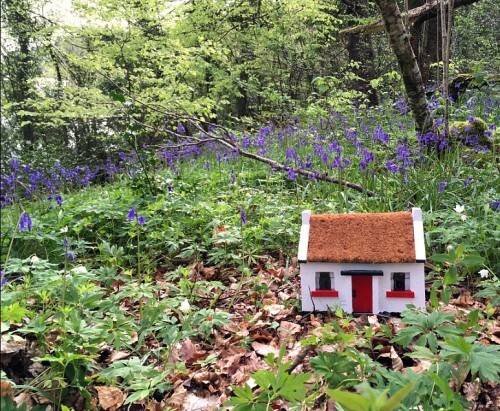 On that occasion we took the opportunity to go out to Castle Caldwell Forest at 7am to photograph a red cottage on the bluebell carpet. And some editing to max out the cutness factor. I just love how the bluebell looks the size of a tree beside the cottage. This poem is about the very real, but thankfully, bygone belief that the fairies would steal children (and occasionally adults) and spirit them away to their fairy world. This superstition is where the saying “away with the fairies” comes from, as the ‘changeling child’ left in the human child’s place would be very different indeed. Still, it is a beautiful poem, full of magic, mystery and melancholy. For the world’s more full of weeping than you can understand”. Yeats depicts the cunning ways of the fairies to entice a young child to come away with them. They invite the child to escape the sorrowful world of humans and exchange it for the thrill of that other-world of fairies and freedom and feasting. This is just the result of me messing around with the Picmonkey editing tools. 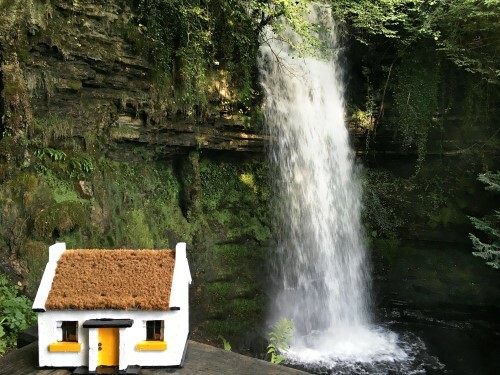 I can just see a tiny elf going in the door of that cottage, perhaps with a little fishing rod and miniature catch. And I’ll leave you now with a spell binding recording of The Stolen Child by The Waterboys. 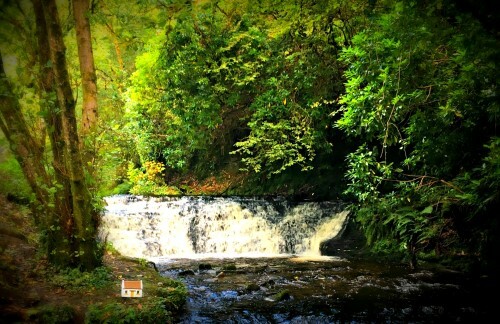 Fun fact: The Sleuth Woods referred to in the poem is actually Slish Woods in Sligo. The Rosses is in fact Rosses Point also in Sligo. Also 2 km away is Ireland’s highest waterfall, The Devil’s Chimney, which includes a more strenuous hill walk open to the public. Thanks Val, glad you enjoyed it.